Resulting in Continuous Profitable Sales & Customer Growth Performance. This is where Outbound Excellence provides value to organizations. 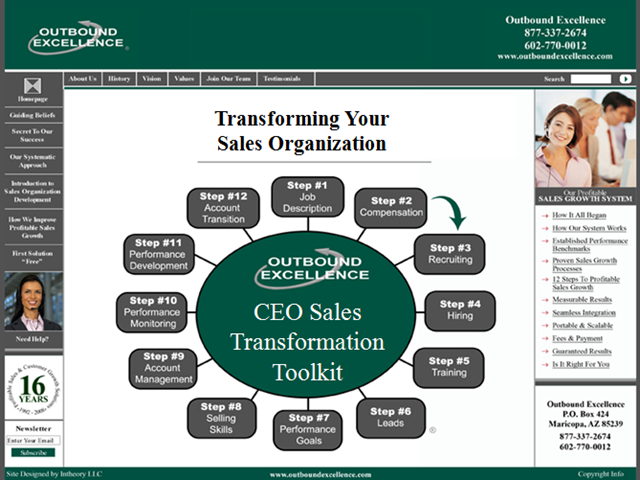 For the past 12 years Outbound Excellence has developed and implemented over 350 Sales Management Processes in 32 different companies throughout North America and Europe. Join us for our webcast, "Sales Management 2011 Sales Coaching and Development Best Practices" where we'll demonstrate a SaaS dashboard panel we've developed, that includes over 100 "Proven" Pre-Designed, Pre-Formatted, Plug n Play Sales Management Coaching Tools that you can seamlessly integrate into your existing Sales Management System and Achieve an Immediate Increase in Sales and Customer Growth Performance. Join us for this webcast and see how easy Improving Sales Growth Performance can be when you provide your sales management team with the industries most effective sales coaching toolkit!